Last week we say the new PC-V352 Desktop HTPC Case from Lian Li, now they have another new gaming case, the Lian Li TYR PC-X2000F HTPC Desktop PC Case. The Lian Li TYR PC-X2000F features a unique side panel that can take up to four 5.25 inch optical drives, and one 4.5 inch drive, allowing your optical drives to be placed on either side of the case. 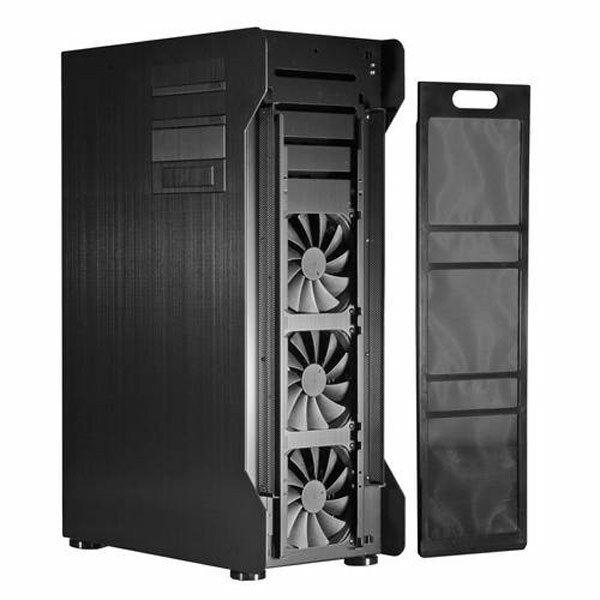 It also has plenty of room for your hard drives, with seven tool less HDD mounting racks that supports even SAS hot swappable HDDs, there is also an easily removeable front panel that hides three 140mm silent intake fans, plus it features four USB 3.0 ports which are mounted on the top of the case as well as one multimedia port for e-SATA and HD audio. The Lian Li TYR PC-X2000F will be available shortly, there are no details on pricing or availability as yet. 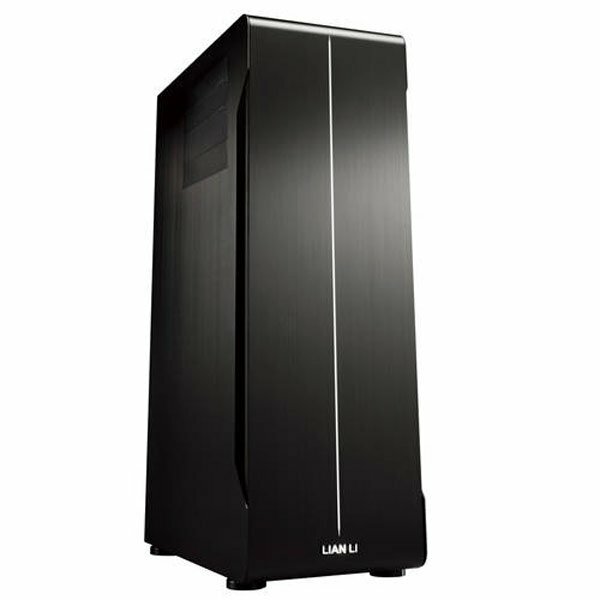 11 May 2010, Keelung, Taiwan – Lian Li Industrial Co. Ltd. announces the TYR PC-X2000F chassis. The TYR line is designed to stand out in your living room in unmistakable Lian Li style. Taking the original concept of low profile and slim designs and turning it completely around; there is no need to hide TYR line cases with their sleek Anodized Aluminum Finishes, giving them the resemblance of multimedia speakers. The new TYR PC-X2000F is set to build on the line’s success and become the most unique HTPC/gaming chassis on the market today. Allowing unprecedentedly high performance components to be encompassed into the home theater environment without compromising looks or appeal, the new TYR PC-X2000F is definitely worthy of the Lian Li label. The stylish and unique side panels accept four 5.25” Optical Device Drives (ODD) and one 3.5” drive with tool-less, sliding mounts that can be placed on either the left or right side, while the front face is for ergonomics and airflow. Unlike Lian Li’s previously released TYR PC-X2000 that had only two 5.25” ODDs, the new TYR PC-X2000F splits the HDD bays between the upper and lower thermal zones for more efficient cooling. Furthermore, the TYR PC-X2000F’s tool-less HDD mounting racks support seven SAS hot swappable HDDs, another increase over the X2000. The spacious interior can accommodate virtually any system you can think of. Lian Li is well known for craftsmanship and quality, and the TYR PC-X2000F is no exception. Showcasing Lian Li’s superior styling, first seen with the X2000, the brand new TYR PC-X2000F does not disappoint with an all black anodized interior, an easily removable front panel which covers three 140mm silent intake fans, protected by a removable and washable nylon dust filter. The Fan Speed Control switch is conveniently placed on the back panel of the chassis. The TYR PC-X2000F boasts four USB 3.0 ports mounted on the top of the chassis alongside one multimedia port for e-SATA and HD audio. Wanting to give users every convenience, Lian Li designed the TYR PC-X2000F with increased space behind the motherboard for cable management, compared to the previously released X2000, to give the interior a clean and orderly appearance. Other traditional Lian Li innovations have been improved upon as well, including the tool-less features introduced by Lian Li this year. Lian Li’s TYR PC-X2000F requires just a few quick snaps to install key components. The design features tool-less motherboard installation, and eight tool-less PCI card holders with rubber pads to hold the graphics cards firmly in place. Additionally, the PSU is now located above a vent on the bottom panel, for added cooling, and is also a tool-less installation. The vent is protected by a removable and washable nylon dust filter. 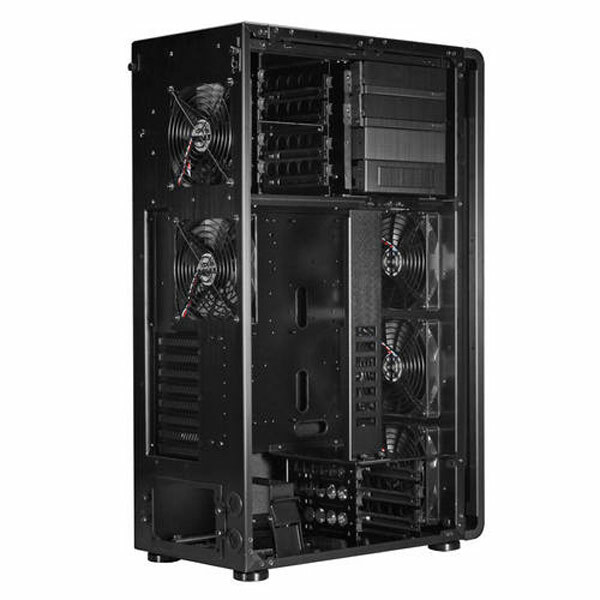 More features include support for Extended ATX, ATX, and Micro-ATX motherboards, water cooling support, 140mm silent exhaust fans for the motherboard heat zone, 140mm exhaust fans for the HDD bay heat zone and further support for the PSU with anti-vibration and insulated rubber strips on the mounting platforms. The case was designed with silence in mind, so specialized sound insulation material combined with the 2mm thick aluminum alloy side panels keep your system whisper quiet. Taking things to the extreme in comfort and convenience, Lian Li mounts the case on rubber pads to minimize any vibrations that could add to noise. Additional touches include vented PCI brackets which add to through flow of air and prevent heat buildup. The essence of Lian Li products is the craftsmanship of the engineering. Intrinsic to the workmanship and quality of Lian Li’s products is their customization capabilities, which include a whole host of optional extras that can be added to an already feature rich product.